I'm excited to join this contest giveaway by Purple Plum Fairy of Security Blanket. What's the prize? A limited Edition Cookbook from Nestle's Centennial Celebration. I want to have a copy of this. I'm hoping to win this. To my fellow food bloggers, if you're interested, you too can join. Click here for the contest mechanics. 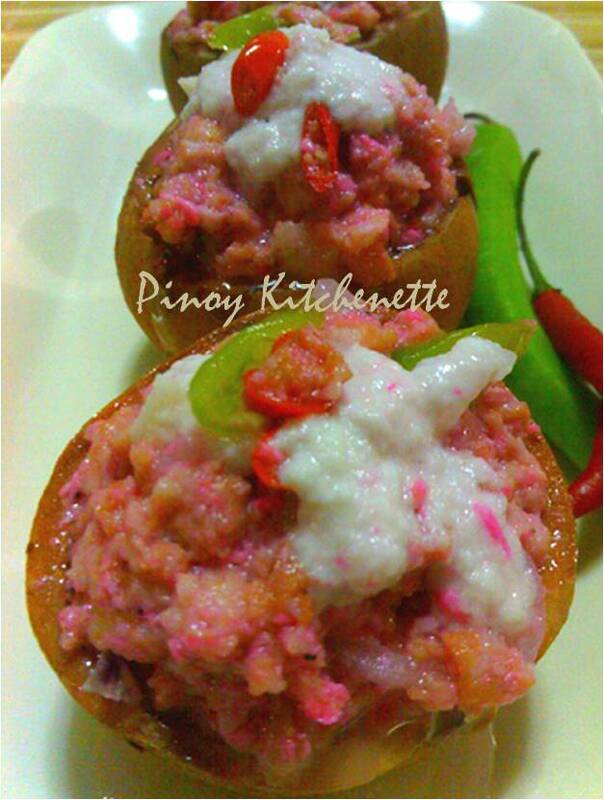 Ginataang santol might sound irky , just like an out-of-this-world food. You see, this is not a usual dish you serve in every Filipino table (or foreign, may i add?). But in Bicol, we cook almost anything with coconut. 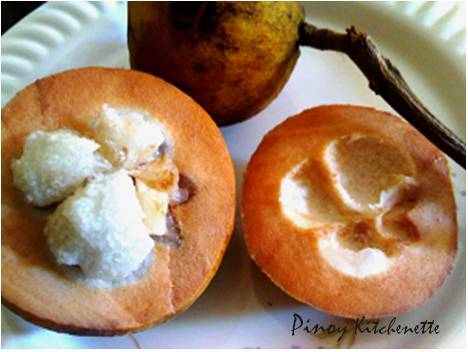 Santol is a tropical fruit commonly cultivated in southeast Asia. 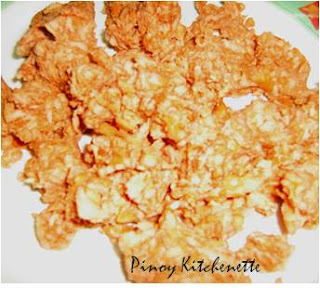 And Philippines is abundant with this. 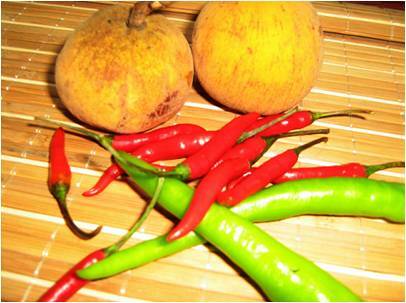 The ripe fruits may have sweet or sour pulp which can be eaten raw. We also use santol as souring ingredient when cooking sinigang or paksiw dishes. 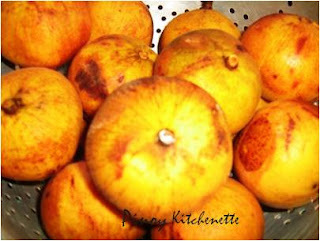 It can be candied or made into marmalade or jam. more chilis if you like it hot! 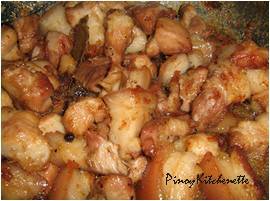 Heat oil in pan, saute ginger, onion and garlic,then brown the pork (pork meat is optional). Add the coconut milk and cream. 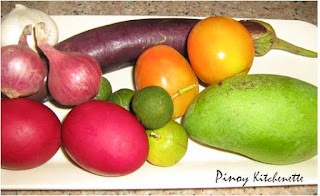 Add bagoong. Bring to boil, while constantly stirring to avoid curdling. 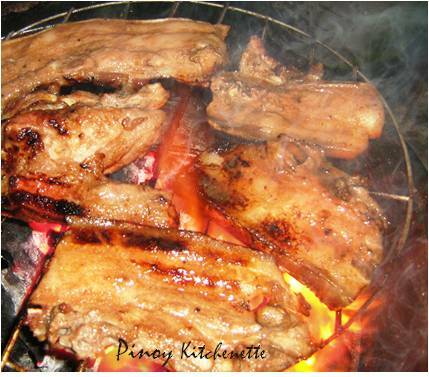 "Inihaw na Liempo" or grilled porkbelly is my favorite among grilled meats. I usually do the marination 1 or 2 days before grilling it, and I make my own homemade marinade. Ah the taste is superb! And I want it char-grilled. And whenever I have Inihaw na Liempo, Ensaladang Mangga and Talong goes with it. 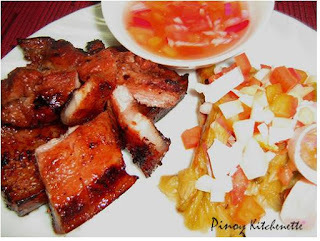 Grilled Liempo + fresh Veggies = hearty and healthy! Mix all the ingredients in a bowl, then pour over meat. Make sure meat is well coated with the marinate mixture. Cover. Store in fridge overnight (or even 2 days like I do). Prepare the grill. Brush grill with a little oil to prevent meat from sticking in the grill. 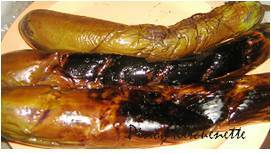 Be careful when using charcoal-grill, keep the flame low so as not to burn the meat. 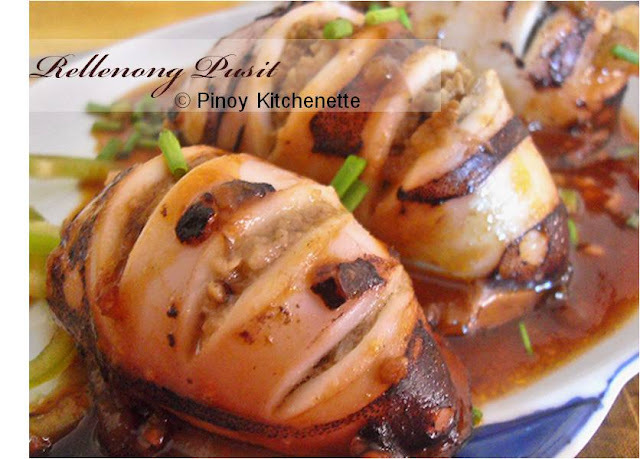 While grilling, keep basting the meat with the marinade sauce, this will make the meat not dry but juicy. Eggplants grill fast. when done, set aside to let cool. 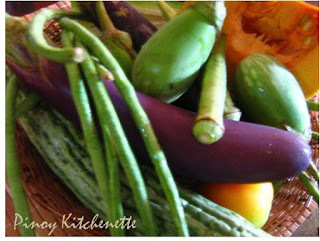 Then remove the skin of eggplant. Then cut it about 2 inches or as preferred. While you are grilling the meat, you can now start peeling the mangoes. Chop it small. The same goes with the tomatoes and onion. And don't forget the salted eggs! Serve all in a platter including the eggplant. When done grilling, you may chop it to bite-size, or just serve it as is. Whatever you like. Serve with rice and sawsawan (dip)! Enjoy! Like i've said from my previous adobo post, Filipino can cook any meat and even vegetables as adobo. 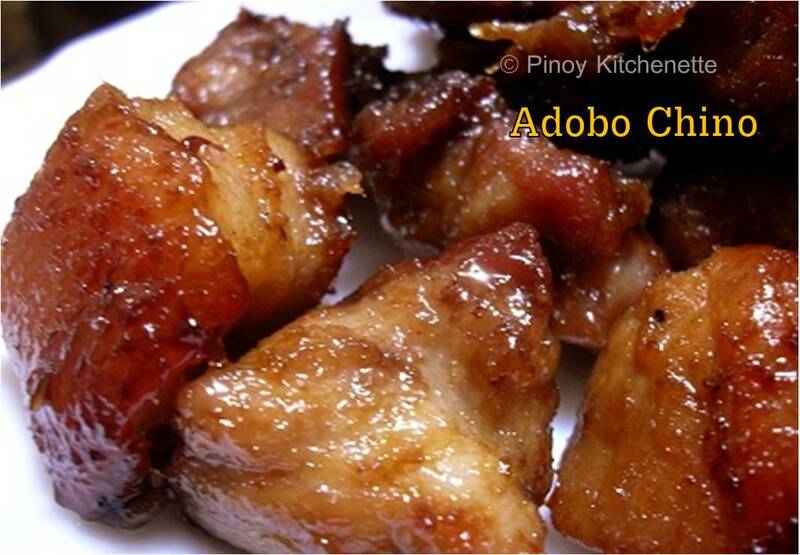 We are an Adobo country, so to speak. 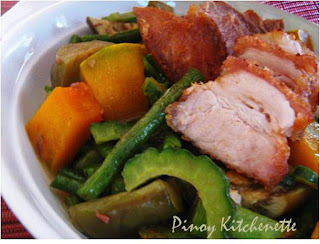 If you would ask any foreigner what Filipino dish they liked, they'd mostly say it's Adobo ~ particularly referring to Chicken adobo or the Chicken Pork adobo mix. 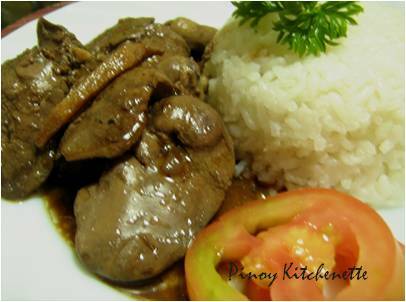 In preparing Chicken Liver Adobo, I always add ginger to remove reeky smell of liver. 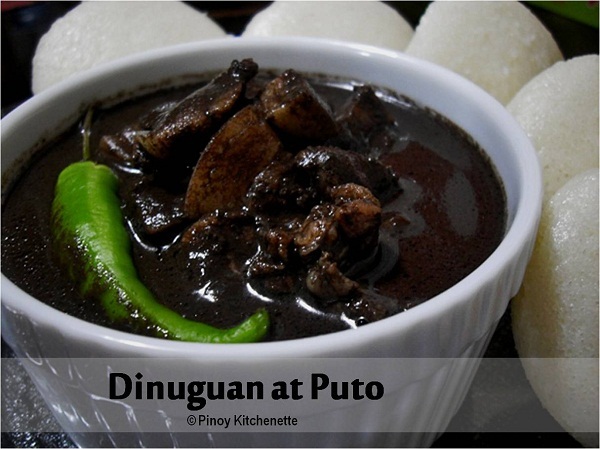 I like this adobo variant with thick sauce. 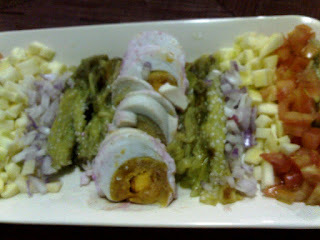 And even my picky-eater daughter loves this dish. 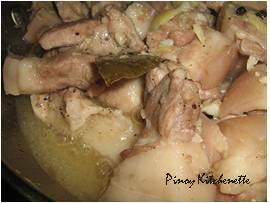 It's Adobo, remember? So who wouldn't like it. Wash then drain chicken livers.Set aside. In a pan, heat oil. 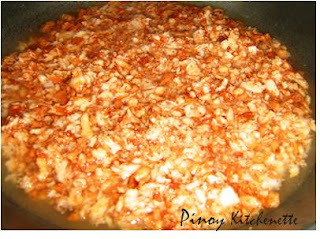 Saute ginger, then garlic and onion. Adjust the taste, add in salt and ground peppercorn. Pour in the dissolved cornstarch. Simmer for another 5 minutes. If the meat is not pink, then it's cooked. Turn off the heat and let stand for 5 to 10 minutes. Clean the fish. 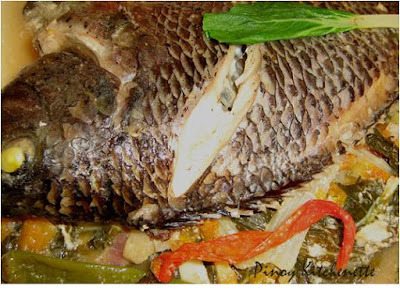 Remove gills, innards and scales ~ or you may have it removed at the supermarket as you buy it. 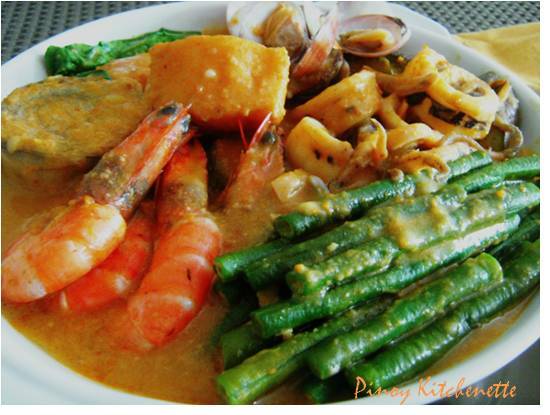 In a bowl, mix together garlic, onion, ginger, kamias, tomatoes, 1/8 tsp ground peppercorn. Insert a spoonful of the mixture inside the slit of the fish (the stomach part) to give a nice flavor to the fish. In a pot, put the pechay leaves. then top it with the rest of the mixture from step 3. 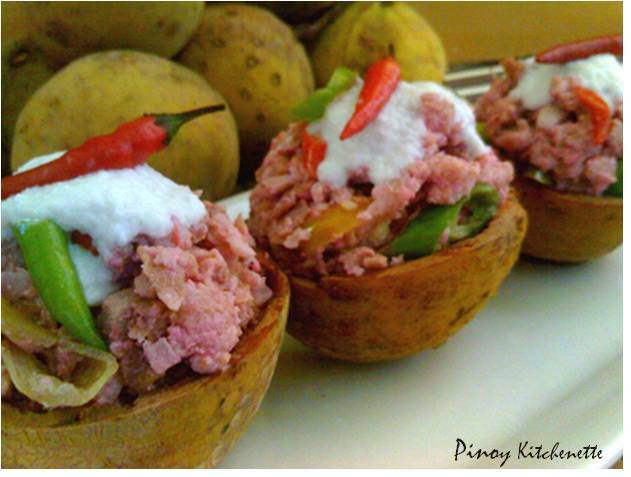 Add the finger chilis. Place the fish on top of it. Then pour the coconut milk, fish sauce, and sprinkle the rest of the ground peppercorn. Cover.Cook and simmer over medium heat for about 15 minutes. Adjust the taste, add fish salt if needed. Note: You can replace fresh kamias with dried kamias, or if not available you may use 3 tbsps calamansi juice or 1/4 cup tomato sauce. Pinoy Kitchenette is now on Facebook! I've decided to have my own page on facebook, so I could link up all the blogsites I want without flooding my personal account and my friend's account. But I am having trouble generating the right code for the Facebook Like BOX here in my site. Help! Finally, after several attempts, I had it right! whew! 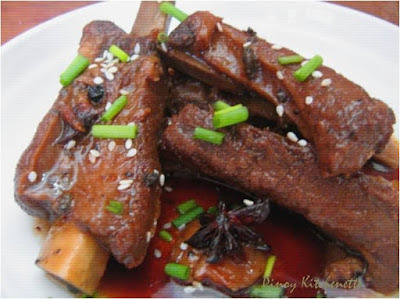 Braising is extensively used in Asian cuisines. Braised meat or vegetables are usually simmered in soy sauce, rice wine and other seasonings. 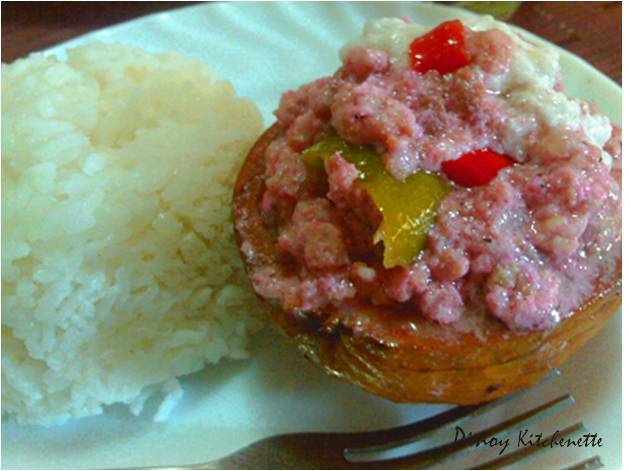 But instead of the rice wine or cooking wine, I made use of pineapple juice, which added a real nice flavor to the meat. I like making use of pineapple to some of my cooking. And like any other braised dish, this makes for a great leftover. It's more tasty the day after. Simply put it in an airtight container and store in the freezer, then just reheat. But much as I would want to store some in the fridge, we can't help but to have some more serving until there's none left. This braised meat is perfect with hot steaming rice. 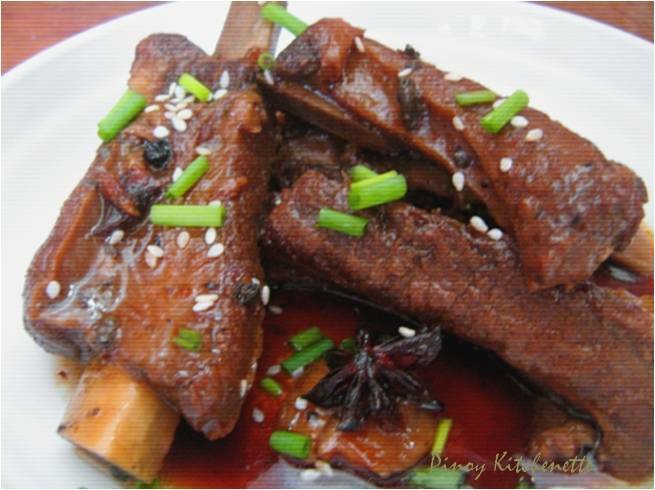 Cut the spare ribs between the bone. Wash. Drain.Set Aside. In a pan, heat oil. Brown the pork ribs, both sides. Add in garlic and ginger. Put all the ingredients. Lower the heat. Cover. 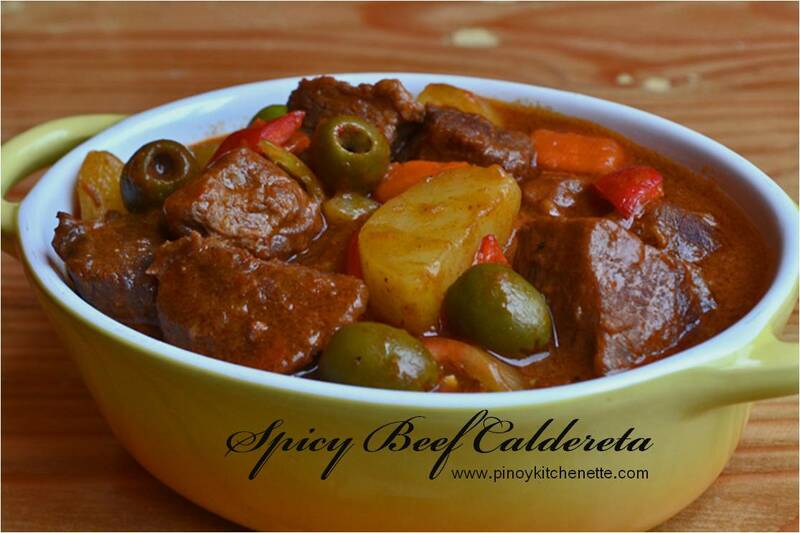 Let simmer for 45minutes to 1 hr or until the meat is tender. Add some water if needed. The minced onions also gives a nice thickness to the sauce. When done cooking, there should be a little sauce left (but my daughter loves the sauce, so she wants more of it). Garnish with spring onions, leaks, sesame seeds ~ whatever you prefer. I added pineapple chunks. This serves 6-8 persons. Enjoy! 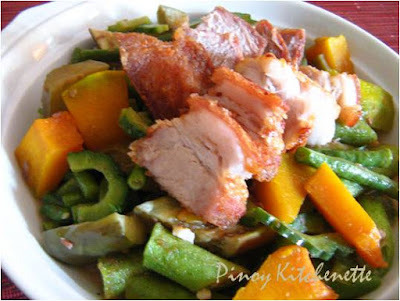 Adobo Chino, not your usual Adobo. This is a Bicolano adobo variant my mother cooks for us. I don't know why it's called Adobo Chino or Adobo Tsino. 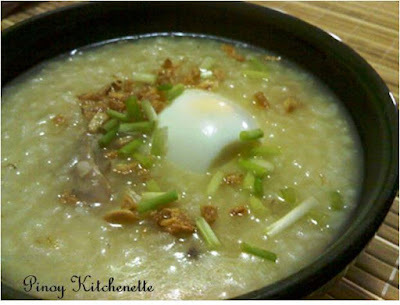 Maybe it has a chinese influence in it, considering that it's called Chino/Tsino, and the addition of sugar in the dish. And what makes this meat dish more tasty is the fat in it. Yes! you read it right :) you do not remove the pork fat. Not so healthy? I agree. But that's what makes this Adobo Chino special. In a pan, combine meat and all the ingredients except sugar. Turn to medium heat. Cover. Bring to boil, stir then lower the heat. 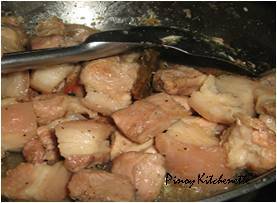 Cover and let simmer for 20-30 minutes or until the liquid has evaporated, and pork starts to render oil. You will also notice the garlic has also thickens the liquid. Add in some salt if needed. 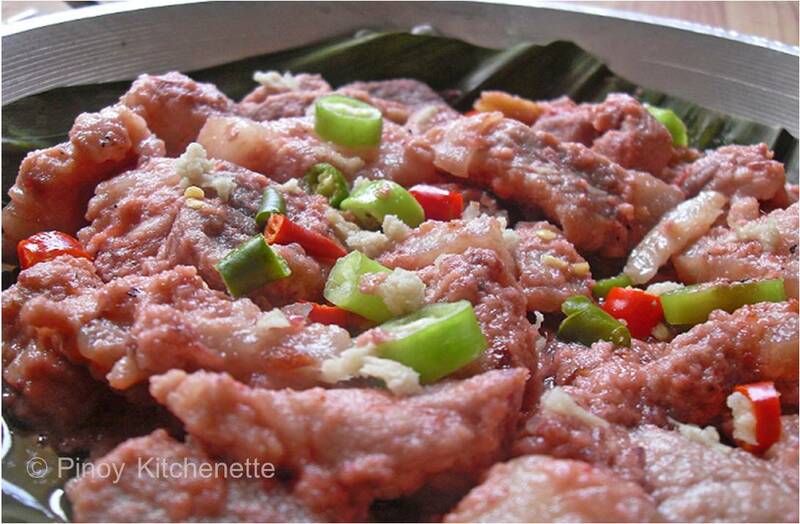 Gently stir the pork until light brown, keep stirring so it won't stick on the pan. keep on stirring... don't burn the sugar. You'll see the sugar starts to melt, but do not burn so keep stirring. Now we coat the meat with the sugar. Again, keep on stirring because the sugar easily burns. Cook for about 10 minutes more. Serve with rice ... and as expected I have it paired with Laing. 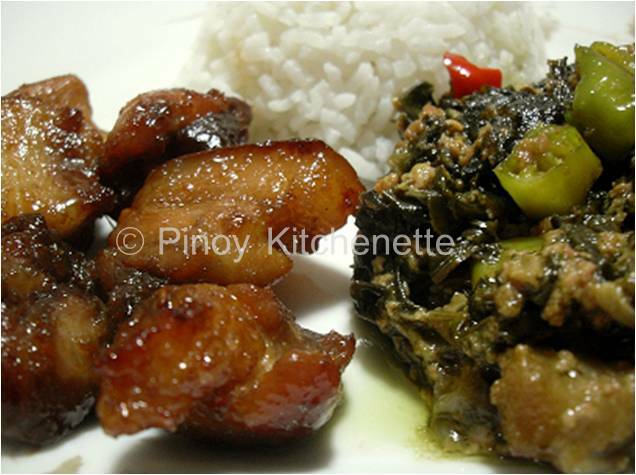 Adobo Chino and Laing = best lunch ever! Tip : I also use the rendered oil from this Adobo in cooking Fried Rice and oiling Paksiw na Isda.